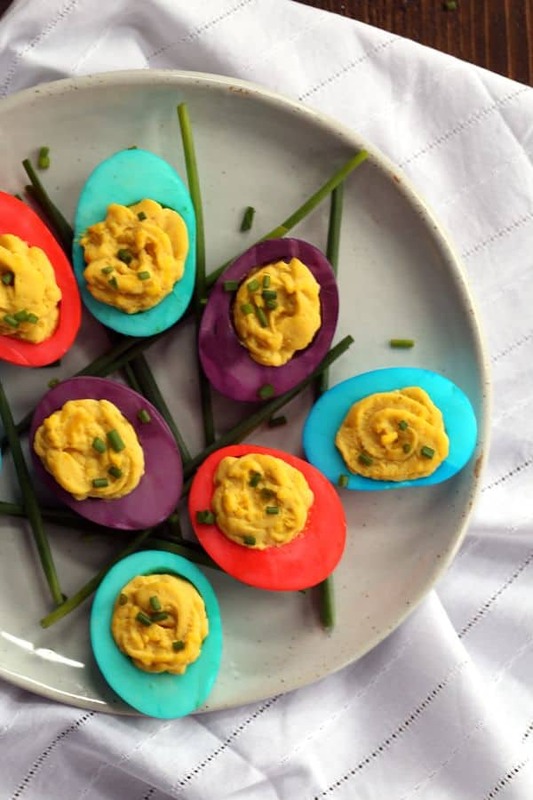 These Dyed Deviled Eggs are an instant Easter – or anytime! – celebration. The hard boiled egg whites are easily transformed into brightly hued beauties. I was compensated by the Ohio Poultry Association to create this recipe. As always, all thoughts and opinions are my own. Thank you for supporting this sponsor that allows me the opportunity to create content, such as this, for Melanie Makes. I can’t believe that Easter is in just a few short weeks. I know this because every week at the grocery store for the last month or so, our three year old asks me if it’s Easter yet thanks to a very large display of egg dyeing paraphernalia situated smack dab in front of the egg case. (Thank you grocery marketing gurus!) And honestly, thanks to my perfectionist tendencies, I really despise decorating eggs. Instead, I boil the eggs and lay out all the dye, stickers and crayons on the dining room table and supervise the menagerie while they go to town. But not anymore! Why dye hard boiled eggs that my children then refuse to eat because then we will have to crack the shells and ruin their artistic endeavors? Instead, why not dye the egg whites themselves and create a colorful holiday side dish or appetizer? 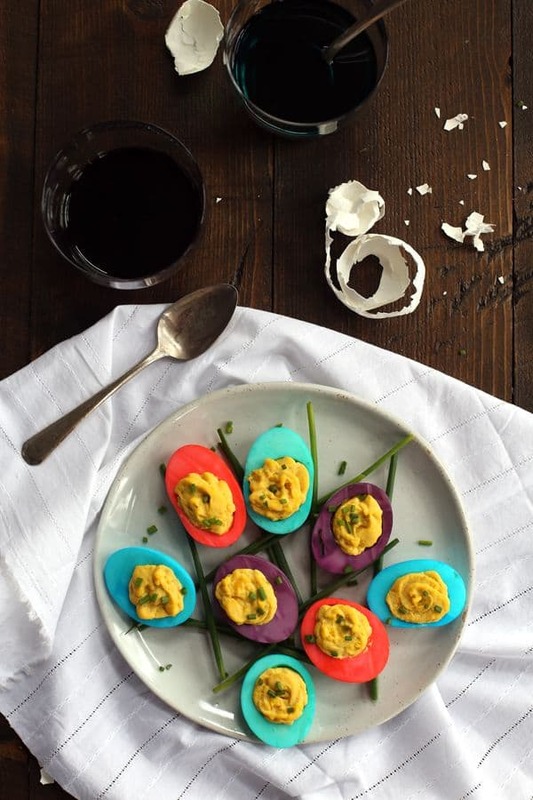 Friends, these Dyed Deviled Eggs are a definite game changer! I mean, serve them with chives as garnish and don’t they look like they’re nestled in grass? Genius! I earned major mama bonus points with this recipe. Even the baby couldn’t wait to get her hands on one. Like literally squealing and pointing until I handed one over. The brightly colored egg whites caused an argument with my oldest daughters who argued over which color was the prettiest. If it’s not one thing, it’s something else, right? 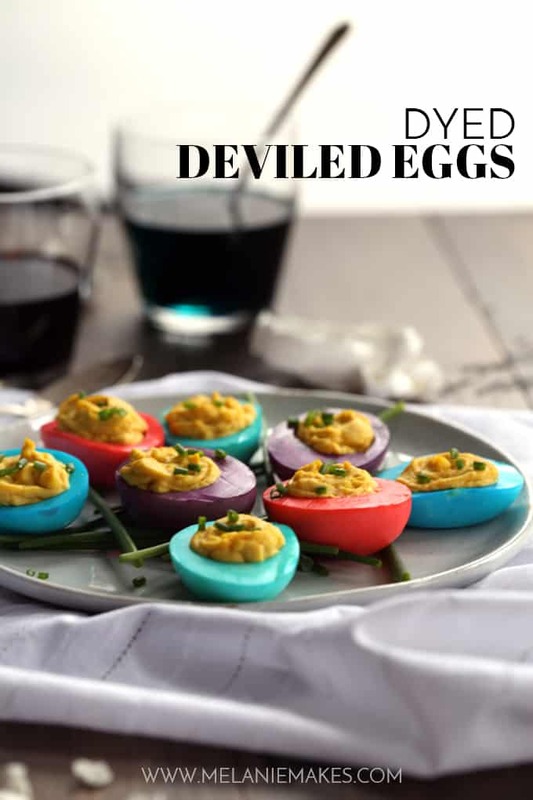 These Dyed Deviled Eggs are a perfect addition to the kid’s table and adult table alike, but in case the older crew is looking for something a little less colorful, they’ll no doubt love my Shrimp and Bacon Stuffed Deviled Eggs or Mexican Street Corn Deviled Eggs. First things first, buy the eggs you want to dye for Easter NOW. Did you know that older eggs peel easier than newer eggs? It’s true! Don’t wait until the last minute to purchase eggs unless you absolutely want the headache of hard to peel eggs. No thank you! This is why I typically have four dozen eggs in our fridge at all times. 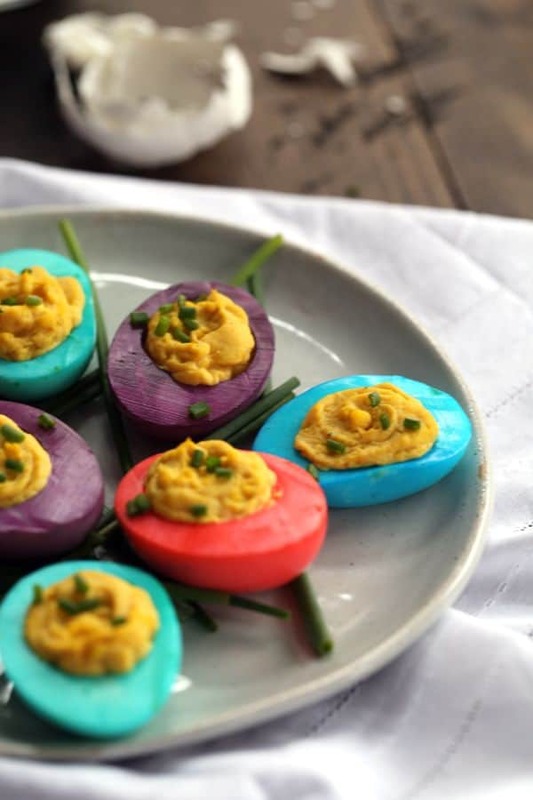 I’m hoping to bid farewell to dying hardboiled eggs in the shell this year and instead have the kids help make these Dyed Deviled Eggs instead. They get to create colorful masterpieces and they also help to check a side dish off the Easter dinner menu. I think I’m already in love with this new tradition! Peel each egg and slice in half lengthwise and remove yolks to medium bowl and set aside. In four cups, add 1/2 cup water to each. Stir in 10 drops of food coloring and 1 tablespoon vinegar to each cup until completely dissolved. Add egg whites to cup and allow to sit until the desired color is reached. The longer the egg white is in the dye, the more vibrant the resulting color will be. Remove dyed egg whites to wire rack over plate to dry completely. With a fork, mash yolks until smooth. Add mayonnaise, mustard, Worcestershire sauce and cayenne pepper. Stir together until well combined. Add salt and pepper to taste. Garnish with chopped chives prior to serving, if desired. After the holiday if you have a few Dyed Deviled Eggs leftover, they’d definitely make a fun addition to any egg salad recipe. Just think of the possibilities if you were to include them in this Classic Egg Salad, quick Light Egg Salad Cucumber Boat Recipe and bite-sized Egg Salad Cups with Smoked Salmon and Dill. This recipe first appeared on the Ohio Poultry Association website, here. I made these last year and they were a hit. Then I couldn't find my recipe and just stumbled crossed it again. Thank you, Pinterest! YAY! So glad you enjoyed them and they made your menu again this year, Jackie! These are SO SO SO cute for Easter!!! My menagerie won't eat dyed hardboiled eggs so this is a win/win - cute and they'll eat them! These deviled eggs are so cute and so perfect for Easter! These will be a winner in my house! I love how vibrant the holiday eggs came out. Great job! I’ll have to make some for the little one. Those would really stand out on any holiday table! Cool idea. I know my kids would help me make them, kind of like dying easter eggs! I already bought the PAAS color dye kit for my kids. Would I be able to use that this time around instead of the food coloring? Hey, Kara - I wouldn't as I'm not sure that you're supposed to ingest that dye since it's typically thrown away with the shell. You're so welcome - hope you enjoy! I've saved this recipe in my recipe box a while ago but I have just tried for the first time. I glad I saved the recipe since the eggs came out so beautiful. Thanks! Thanks so much, Sophie - so glad you enjoyed them! What a great idea for dyed eggs, I gonna make more color than 4, my daughter definitely love this, when she sees it in her lunch box! Such a fun idea for a lunchbox! Thanks for your recipe and wait a new post! What colors did you use for this plum? Having a hard time getting this color with food coloring. Hey, Natalie - I find I have the best luck with gel food coloring rather than the liquid squeeze bottles. Hope that helps! just made these for memorial day. best dyed eggs. ive done this before but the vingar really made the color pop! made red and blue ones and left some white. also noticed that the vinegar seems to make the whites firmer. haven't tasted it yet but they look amazing. Love that you made a patriotic version, Kim - your comment totally made my day! Trying these for a school St Party's day social. Just one question...can you taste the vinegar in the egg whites? Hi, Brandi - NO, you can't taste the vinegar! :) Hope they're a hit! Pretty sure everyone would love to make these for Easter! Silly question, but does the dye stain your mouth at all? So festive and pretty! Everyone loves Deviled Eggs. I think I am going to have to make these for Easter! Let me know what you think if you give them a try, Chandra! I have no doubt they would, Jessica! Well how fun are these!? 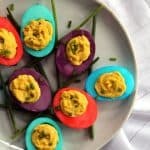 My whole family DEVOURS deviled eggs and I'm sure they would love this bright twist! Thank you, Cathy! They definitely are a fun twist and definitely made dinner more colorful! Melanie, these eggs are so pretty! Deviled eggs are always served at my house at Easter but they certainly aren't as festive and appealing as yours are. These are so easy, I'm going to try making them this year! Thank you so much, Joanie - let me know what you think if you give them a try! These are so cute!! And your daughter is too adorable! Your daughter is SOOOOOOO adorable! These eggs are amazing, Melanie! You can never have too many deviled egg recipes! 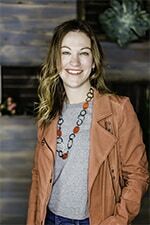 Thank you, Justine! She just had to have one of those eggs! Aww. Your daughter is so cute! And I can see why she's so eager to get at them. I've never seen such colorful eggs! 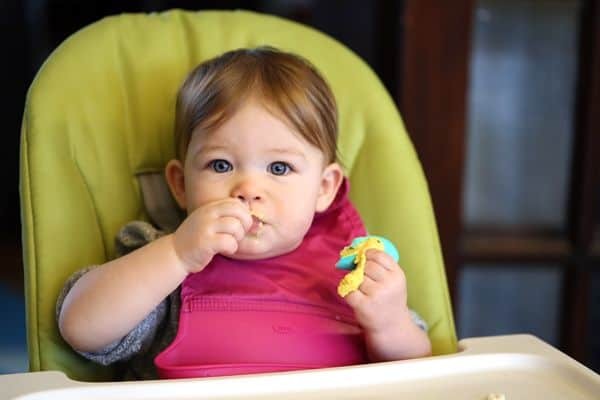 What better time than to give eggs a try for the first time, right Erin?